It’s Sunday afternoon, its almost the end of september 2015. You have been good all week doing your workouts, you are well prepared for the coming week, you have been kind to your children/ husband/wife (pick an appropriate alternative). Now it is finally you-time! 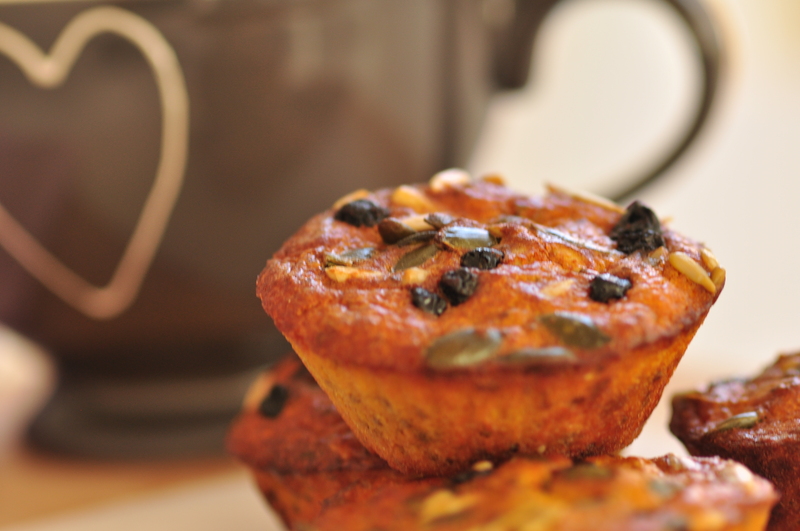 Baking muffins are fun, tasty and they works perfect with your big cup of tea and a good magazine. And they just happen to be good for you as well. And totally in season. What else can you possibly want? Prepare your muffin cups (they don’t need to be greased) and put them on a tray. Add everything part from the seeds and blueberries to your domestic mixer. Put the lid on and let the knives run until you have a smooth dough. Then add the seeds and blueberries. Run the machine for a short while so that everything get mixed (but still recognizable as seeds and berries). With a spoon, distribute the muffin dough to the cups. Add som extra seeds and raw blueberries on top for the beauty of it. Place the tray in the oven and set the alarm for 25 minutes. Meanwhile prepare your cup of thee, get your magazine, make room in the couch, get a blanket. When ready, so should the muffins be. Let it cool down for a short while before you dig in. P.S. The muffins taste just as good on a normal week day, put them in the freezer and defrost at the right moment. Slice them in two and slightly toast them. Enjoy with a nice knob of butter!